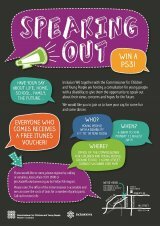 Youth needed for consultation - Win a PS3! 3 years ago when we re-branded Inclusion WA we produced our first official corporate brochure, mostly it related to our vision for inclusion however I also wrote that Inclusion WA was a partnership focused organisation. We continue to believe very strongly that working in partnerships brings much greater results – whether with individuals, families, other community service organisations or with government and the business sector, we can achieve better outcomes working together. There has been much talk of late about how the recent changes within the disability sector will create fierce competition. Perhaps they will, but I still think working in partnerships rather than competition will provide better outcomes and opportunities for all. To that end Inclusion WA has recently partnered with H2 Training and Consultancy (Senior Consultant Heather Simmons) and will soon be creating exciting and thought provoking new offerings for the sector. I look forward to sharing those with you. Inclusion WA is urging any young people with disabilities to get in contact and sign up for the Speaking Out consultation. There are three inclusive programs kicking off this August/September in the northern suburbs. Over 200 people enjoyed a fun packed evening at this year’s Inclusion WA Quiz Night. The latest edition of In Form’d - Inclusion WA’s Sports Newsletter - is available to read online. Recreation Development Officer Nicola share a story about her member, Joseph. I began working with Joseph last year and he told me that he wanted to meet new people and find a new hobby. When I met Joseph he would work full time and come home to an empty house as he lives on his own. Joseph said that he sees a friend occasionally on the weekend but other than this, he would only spend time with his family or by himself. This was surprising as Joseph was very welcoming and friendly and I could see that he enjoys interacting with people, and in particular I noticed that he likes making people laugh with his jokes. Joseph wanted to find a hobby that he could travel to independently, and although he drives, he will only drive to places that he is familiar with, and will stay in close proximity to his suburb. Joseph and I felt that it would be beneficial for him to join a group or club that would promote social interactions in conjunction with the main activity. Joseph told me that he would like to give Lawn Bowls a try but hadn't really played before. This was a great idea as Joseph lived down the road from his local bowls club and could easily drive or walk down to the club. Joseph and I went down to the club and met with Murray President of the bowls club, who was highly regarded for being a great coach. Murray was very welcoming to Joseph. He started off by giving Joseph one on one coaching bright and early on a Saturday morning prior to him playing his tournaments. When Murray doesn’t have a tournament he still comes along on a Saturday to help Joseph improve his skills, so that he can reach a level where he can play social bowls with the other members. At the end of each session Joseph buys Murray a coffee in appreciation for the coaching and this allows them to get to know each other outside of the game, and Murray introduces Joseph to other club members when they arrive at the club. In fact, the majority of the time Joseph does this himself without Murray's help. Since Joseph began attending bowls coaching, he continues to build his skills and social connections. He now goes along on a Tuesday evening and, he occasionally has a social game of bowls with other members of the club. Murray is also looking at finding a buddy for Joseph to play with so that he can learn from different people to improve his standard of play, and this will also help Joseph get to know other members of the club. With a little more time and practice, the aim is for Joseph to play social bowls regularly in the near future. Joseph is continuing to get to know other members and is treated the same as everybody else at the club. He therefore feels as though he is a part of the lawn bowls family at the local club. Joseph now has a valued role and the skills that he has developed can easily be transferred to other clubs and other sports as and when the time is right.